14 Questions Intelligent Muslims Need to Answer. The headlines are unmistakable. Our world is on the precipice of extraordinary cataclysmic change. The conflict between two great world religions - Islam and Christianity - is fast approaching a devastating climax that will shake the whole world. Indeed, the face of Western Europe has already been transformed through rapid Islamic expansion, and the fear of terror and holy war pervade the American psyche as multiple conflicts rage in the Middle East. But what happens next, and when? In an age of constant unpredictability, how can we really know what the future holds? After a decade of careful study and scholarly legwork, international speaker Tim Roosenberg unveils a staggering new study of Bible prophecy that demonstrates that God's Word is not silent regarding Islam in these last days. 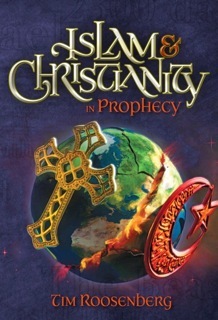 ISLAM AND CHRISTIANITY IN PROPHECY carefully explores and unlocks the mysterious book of Daniel, specifically chapters 11 and 12, unveiling a thrilling picture of prophecy that includes the past, present, and future roles of Catholicism, Protestantism, Islam, and the United States in the final conflict ahead. Along the way, Pastor Roosenberg provides the answers you need to survive the coming holy war, answers that will give you complete confidence in God's Word and faith in the promises of Jesus Christ.